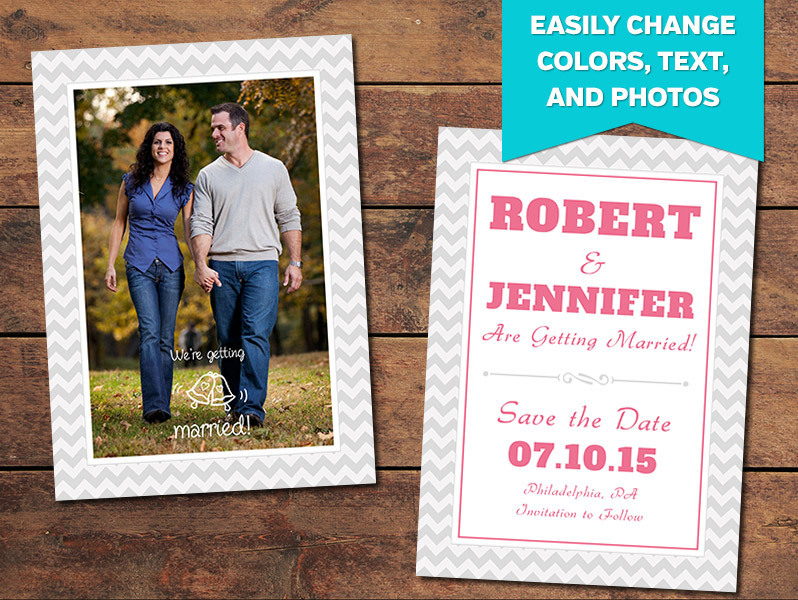 Creating a beautiful save-the-date card for your clients is easy with the help of this Photoshop template. You’ll get .psd files for the front and back designs of a 5 x 7 card plus bleed, and your own photos can be easily inserted through the use of clipping masks (the download file includes a documentation PDF with instructions). Customize the template as needed by changing colors, text, and fonts. The template can be used in Photoshop and Photoshop Elements. Please note: The “we’re getting married” text is not editable. You can change the color of this overlay, change its position, or hide the layer to remove it altogether, but since it does not use a text layer the words cannot be edited. The template was designed to the specs of Bay Photo Lab, but can be adjusted to suit the specs of other labs or printers if you prefer. Stock photos shown are for preview purposes only and are not included in the download. Fonts are not included in the download due to licensing and copyright restrictions, but the download includes a fonts.txt file that lists the fonts used (free to download), as well as the URL where you can download each font.